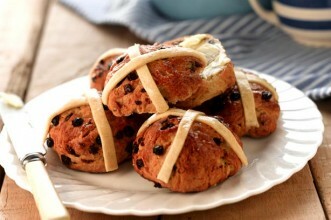 Nostalgic feelings for warm summer days as the cold starts to set in can be satisfied with a delicious traditional Easter treat that ticks all the boxes for the vegans. In a large bowl mix the flour, spices, yeast, sugar, currants, mixed peel and lemon rind. Make a well in the centre and add the melted coconut oil and some of the warmed soya milk. Mix until a soft dough is formed, adding more milk if necessary. Turn out the dough onto a floured surface and knead for about 10 mins. Place in an oiled bowl, cover with cling film and leave in a warm place until doubled in size, which will take about 1 -2 hrs. Meanwhile to make the crosses, rub the coconut oil into the flour and add enough water to bind. Roll out the pastry quite thinly then cut into thin strips. Once the dough has doubled in size, knock it down and knead for 5 mins. Divide into 12 pieces, roll each piece into a ball and leave on a greased baking tray. Leave to rise again for about 30 mins. To make the glaze heat the water and sugar in a pan until the sugar dissolves. Leave to cool. 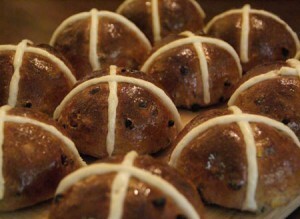 Glaze each bun and top with pastry crosses. Bake at 180°C/350°F/gas 4 for about 20 mins or until golden.